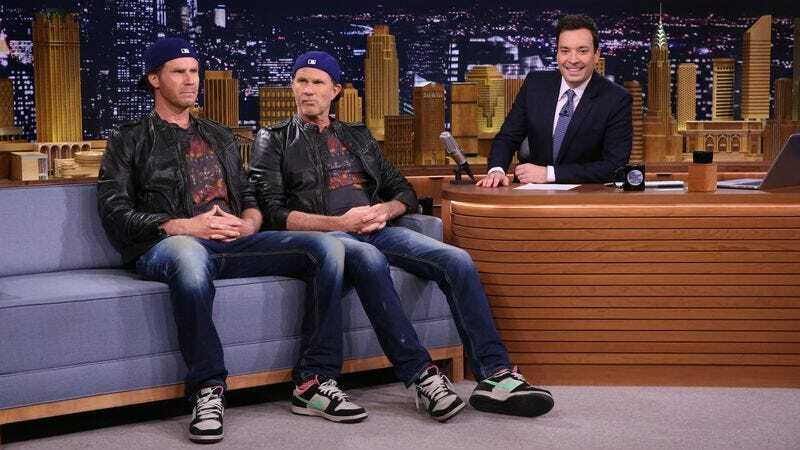 It’s long been a music industry joke that Will Ferrell and Red Hot Chili Peppers drummer Chad Smith look a lot like each other. Last night, that joke finally came to a head, as the two—making good on a challenge thrown down during a Reddit AMA—dressed alike and went head to head in a drum-off on The Tonight Show. While Smith is (obviously) the better drummer, Ferrell gives him a Questlove-aided run for his money, with the whole thing ending in a “surprise” performance of “Don’t Fear The Reaper” aided by the rest of the Chili Peppers and Ferrell-supplied cowbell.